I also made some decorated tin gift boxes with decoupage! 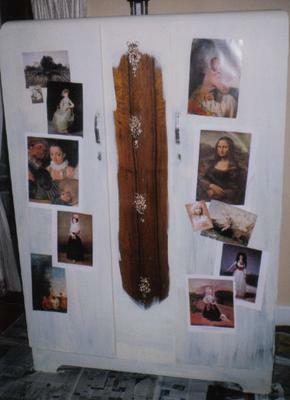 I wanted to make my old wardrobe 'pop' with some unique form of decoration, so I decided to decoupage the doors. 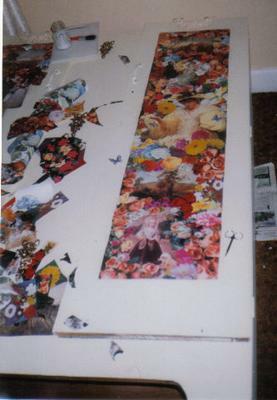 For the decoupage images I selected people in beds of flowers. This was a style of decoupage I had seen years before in Mietta's at Queenscliffe, and I loved it, so I decided to try and recreate the effect of that work. So I chopped up some old art books *ACK! * and used the portrait images to layout around the doors. Then I selected giftwrap paper with beautiful floral designs and chopped those up. I also selected some images with a bit of 'landscape' in the background of the portraits, so that they eyes would have a bit of a 'window' to escape through, rather than becoming overwhelmed by the flowers and people and have 'nowhere to go' to escape the overall image of the panels. 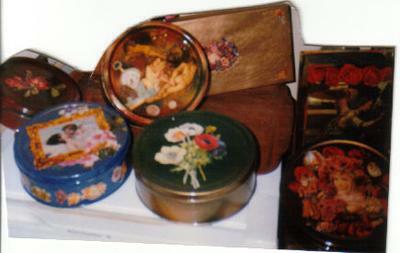 I think that the compositions worked well, for the very first attempt at using decoupage to decorate furniture! The wardrobe is still in my spare room, that I'm converting into a craft room. For a while I had it in the lounge room with the TV and stereo etc. as a nice way to hide the electrical systems in the lounge, as all my furniture and decor is 'antique' style. So, once the images were glued in place, I pained a layer of glue mix on top of it, and then a layer of estapol. And more than 10 years later it still looks wonderful to me. Would you ever consider doing it yourself? 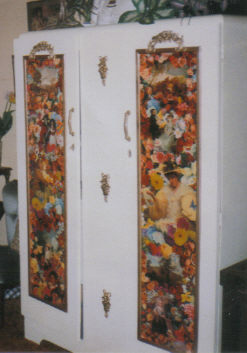 Would you like to learn how to use decoupage to decorate furniture? If so, I'll detail how to do it on the site here.